Over the last generation and a half in the industry, the concept of taking your console on the go has gained traction. If you’re one of those people who need your Xbox One or PS4 wherever you go, GAEMS is the company with a monopoly over that niche. But, since different gamers have different tastes, there are a few options out there. 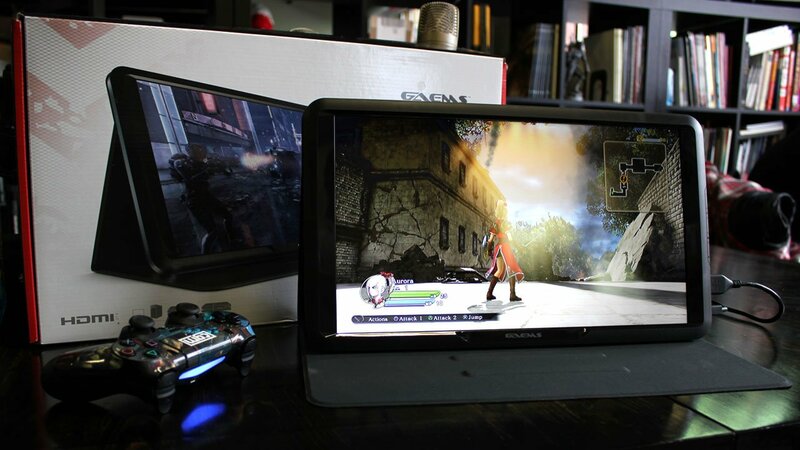 One such option is the GAEMS M-155. Sporting a light screen and a slightly protective case, this monitor does the job. To simplify the product, it’s a screen that you can take with you. It sports an HDMI port, a headphone jack (but no speakers), and powers from a split USB cable that plugs into your console and leaches from its power supply. It’s a pretty novel concept, and it works; it’s just a portable TV. The case actually screws into the back of the monitor and doubles as a stand once opened. It’s a very practical device and its lightweight design makes it extremely portable. Unfortunately, there are some design flaws. To start, it feels cheap. The plastic shell is really durable, but it doesn’t feel that way, and the packed-in cables are horrifically short, so you’ll need to use your own. This makes the setup process a huge headache. The USB cord was so small that in order to work the device properly, my console had to face another direction from the screen. I had to actively turn the monitor around to the other side of the table so I could set it up properly; it was unnecessary and frustrating. Once I finished fumbling around with wires and junk, I had a very good time with the device. It’s versatile; it can be used as a second screen for a computer, or a monitor for console gaming on the go. There was almost no lag with its 60 HZ refresh rate, and games looked crisp on the 15.5-inch 720p LED screen. There really wasn’t a single problem with the performance of this screen. Its case is pretty sweet too. It folds over the screen like a bookcase, but it has ridges to angle the device at 110 degrees, 120 degrees and 130 degrees so glare won’t ever be an issue. I just have a problem justifying paying $169.99 USD for a screen to lug my gigantic next-gen console around with me. This isn’t a briefcase like the Vanguard where you can pack the system in with the screen; it’s sort of cumbersome. It works if you’re staying at a hotel, but not if you want something to play on a long plane ride. If you’re looking for something to play on a long trip, then a 3DS or a Vita make more sense. But that doesn’t mean there isn’t a niche that would enjoy this product. It’s more entry-level when compared to its Vanguard counterpart, but its sleek design and versatility make it pretty easy to take with you if you plan on spending time away from home. But it’s light, inexpensive feel and poorly planned included materials make this device seem like less of an option than it is. If you can get past the aesthetics and use your own USB cord, then this is pretty good buy. 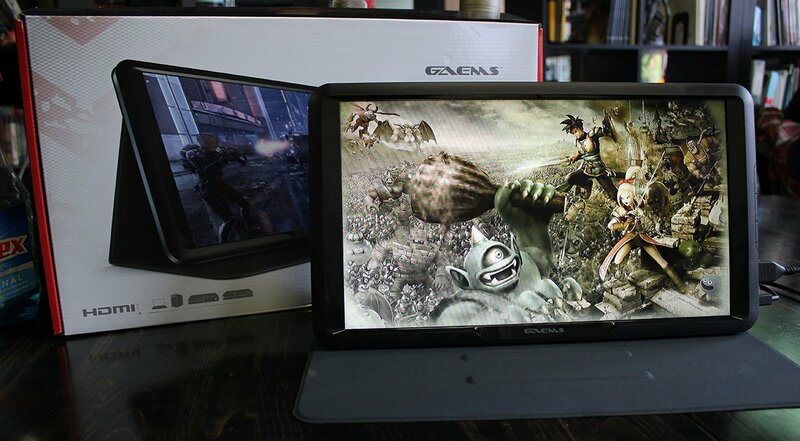 One such option is the GAEMS M-155. Sporting a light screen and a slightly protective case, this monitor does the job.